We investigated the interspecific variation of silver nanoparticle (SNP) sensitivity in common cladocerans (Daphnia magna, D. galeata, and Bosmina longirostris) and the exact cause of both acute and chronic toxicity focusing on the form of silver (NPs and ions). Materials tested were non-surface-coated silver nanocolloids (SNCs) and AgNO3. The results of the acute toxicity tests support the theory that the effects of SNPs on aquatic organisms is mainly due to Ag+ released from SNPs. Among the three cladocerans, D. galeata was more sensitive to silver (as Ag+) than both D. magna and B. longirostris. Moreover, the chronic toxicity of SNCs was also derived from dissolved silver (especially Ag+). SNCs (as total silver concentration) showed far lower chronic compared with acute toxicity to daphnids because the amount of dissolved silver decreased in the presence of prey algae. 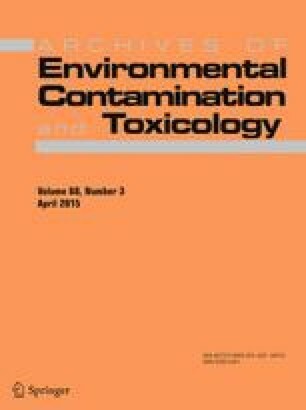 The chronic end-point values (EC10 values for net reproductive rate and the probability of survival to maturation) did not differ largely from acute ones (48-h EC50 obtained from acute toxicity tests and 48-h LC50 estimated by the biotic ligand model) when the values were calculated based on Ag+ concentration. The α value (concentration at which intrinsic population growth rate is decreased to zero) estimated by a power function model was a reliable parameter for assessing the chronic toxicity of silver. The authors thank N. Watanabe for kind assistance during the experiments. We are grateful to T. Kusui for helpful comments on this study. This study was supported by Grants-in-Aid for Scientific Research to M. Sakamoto (Grant No. 23510031) and to S. Kashiwada (Grant No. 23310026) from Japan Society for the Promotion of Science.